This widget includes three layout options: Tabs / Toggle / Accordion. These three layouts give a quick view of a lot of content in a very comfortable way with no big screen space required. 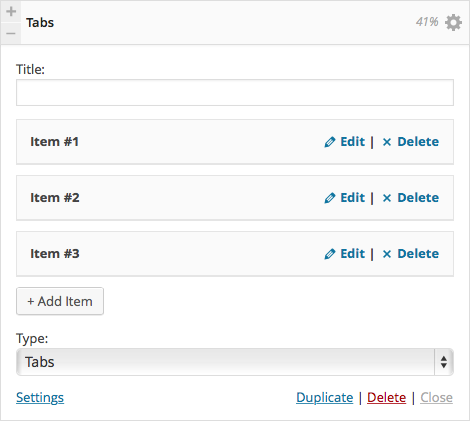 You can add any kind of content or image into the tab as the Tabs widget is controlled by the WordPress editor. Great to use in your Home Page, FAQ pages and all widget areas in your site. Add an Item: Clicking this button will add a new item to edit. Click Edit and an editing window will open for you to enter all the details. Type: Select the layout that you would like for your tabs. Content: Here you can enter the tab’s body content.